If your band's first album was a critical success, what do you do next? You lose your freaking mind, that's what you do. 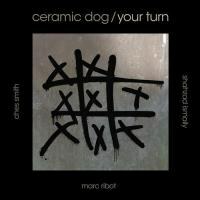 Marc Ribot gets the last word on the press release for Your Turn by asserting that "Ceramic Dogs just wanna have fun." The truth is, they're out for blood. Just look at that cover, a tic-tac-toe board mocking its opponent with just one empty space, awaiting your futile move. My turn, you say? Can I at least get my affairs in order first? For anyone who is just now playing catch-up with Marc Ribot's career, the restlessly creative guitarist often said that he had not been in a real rock band since high school. Wanting to fulfill that rock edge to counteract his jazz and Cuban knacks, Ribot formed Ceramic Dog with bassist Shahzad Ismaily and one of those jazz drummers everyone wants, Ches Smith. But with Ribot being Ribot, he couldn't just play straight ahead "rawk". This music had to be sloppy in form yet tight in execution, cerebral in style yet primitive in emotion, and atonal in theory while being accessible to the listener's ear. Ribot's screwy take on the rock guitar is what made Party Intellectuals one of the best albums of 2008. So what do you do for a second act? If your answer was "quiver in one's boots," you are on the right track. Ribot admits that the Dog felt the pressure of avoiding the sophomore slump and that Your Turn is the result of more than one stab at nailing down the band's true sound. This could explain why the album, even in its "fun" instrumental moments, comes out sounding so punchy and cynical. With caustic properties that could rival your favorite punk record, Your Turn will leave you exhausted. Your Turn is aimed at our times. Whether or not this prevents the album from becoming timeless remains to be seen. Ceramic Dog's foreboding adaptation of James Oppenheim's labor poem "Bread and Roses" was released as a free mp3 on the first anniversary of the Occupy Wall Street movement. The guitar figure is one of those contradictory zingers that stings harder than the blues but also outmopes Joy Division. There's a snake-charming lamentation of the future of music distribution on "Masters of the Internet", major thug rock in the vein of the Beasties with "We Are the Professionals" and a wonky raggae shoutout to Obamacare, "Ain't Gonna Let Them Turn Me Round" where Ribot's nasal but soulful voice assures us that "this old song, it ain't so complicated / pick a brother up if he falls down". Even Ceramic Dog's tribute to a recently fallen jazz giant is surprisingly irreverent. Paul Desmond's "Take Five", made famous during his time with Dave Brubeck's quartet, is intentionally played wrong. It starts off with the right beats per bar, but the melodic takedown of the bridge is enough to put half of the jazz department at Berklee into comas. At a few points, the beat seems to be missing altogether. But Smith. being who he is, always sneaks it back into Ribot's dangerously indulgent mess. It's great. Though it's tempting to gear any discussion of Your Turn towards the vocal numbers, the album is mostly instrumental. No surprise there, though one must remember that this is Ribot's idea of "rock". Fans of rock music will probably find these pieces overly cerebral and atonal, and anyone who has found themselves with a copy of Your Turn via Marc Ribot's jazz associations might flinch from the hard edge. That sweet spot in the middle is where you should gauge your taste before unleashing something like "Ritual Slaughter", a neck-breaking shuffle that, much like "Take Five", teeters on self-destruction during its bridges. The closing number "Special Snowflake" could almost pass as anthemic, even at one minute and 39 seconds in length. It points skyward, sticks in your head, and sounds nothing like three guys bashing it all out in a dingy New York City basement. But Ceramic Dog sure do know how to break the blues on "Mr. Pants Goes to Hollywood", where a honking harmonica (or the six-string equivalent) has more in common with a broken bicycle than the Mississippi delta. And I don't even know what's going on with "Prayer". If anyone uses the wide, splattering end of the wah pedal as a form of meditation, I'd like to meet them. The scary thing about Marc Ribot and his new(ish) band is that all of these styles and quirks are pulled off so convincingly. It's hard to believe that this is the same guy who contributed guitar to albums by Elvis Costello, Marianne Faithfull, David Sanborn and the Grammy-winning collaboration between Robert Plant and Alison Krauss. Even within his own solo discography, which includes the academically-minded Exercises in Futility (a Tzadik release, in case you were curious), there is little to prepare you for the bare-clawed onslaught that is Ceramic Dog. And with their first album well behind them, they are even fiercer than before. It's almost enough to make you worry about the band's collective health. If they're just going to become more rocking and more cynical over time, Ribot's going to play himself right into a wheelchair. Here's to hoping that this project doesn't burn up in the kiln.